As summer zooms up on us, I find myself not quite able to indulge in fantasies of backyard bbqs and beach days. Instead, my head is swimming with measurements, cardboard boxes and the psychic and physical clutter of moving. My natural inclination towards tidiness and order are being foiled by the unavoidable chaos of a move in progress. But fortunately this is just the sort of situation that the yoga practice is custom built for! Below you’ll find the grounding and calming yoga practices that I’ve been using to keep myself from throwing all my worldly possessions in the dumpster…rather than have to organize them in boxes. Even if you aren’t rearranging your entire life, these practices can be useful techniques for turning inward and escaping the chaos whenever life gets busy, stressful or overwhelming. Also, a few simple, low equipment recipes from Katherine to help keep away from eating junk-food while my kitchen is in boxes! This is one of my all-time favorite yoga poses. It is at once a gentle inversion, a forward bend and a restorative pose. There are lots of different ways to do legs up the wall, but my current favorite is with a blanket under my pelvis and a strap around my legs. Spend anywhere from 10 breaths to 10 minutes in this relaxing and grounding posture. As an added meditation here, you can allow your mind to watch the breath as it comes in and out; slowly letting the mind clear and empty by keeping your attention focused on the inhale and exhale. Forward bends have not always been my favorite, and though they are said to be soothing and calming, in the past I’ve found them a bit of a struggle. 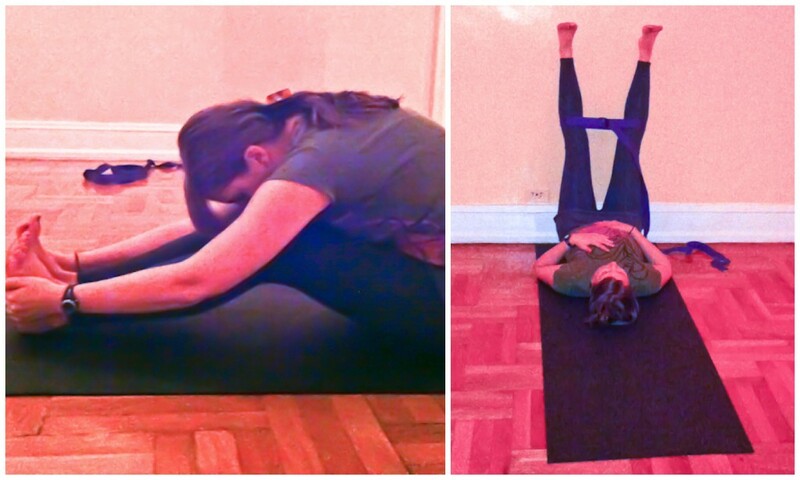 That is why I love this version of paschimottanasana with knees deeply bent. I think about curling into a little ball and letting the weight of my whole torso rest as I come into this pose and it helps me to unwide any tension in my back. This is my favorite pranayama technique for when I’m stressed out. It can be pretty intense if you’ve never practiced any sort of breathwork before, so just do a few rounds at a time with a few normal breaths in between to start. To begin, you take your thumb of your right hand to your right nostril and your ring and pinky fingers to your left nostril. 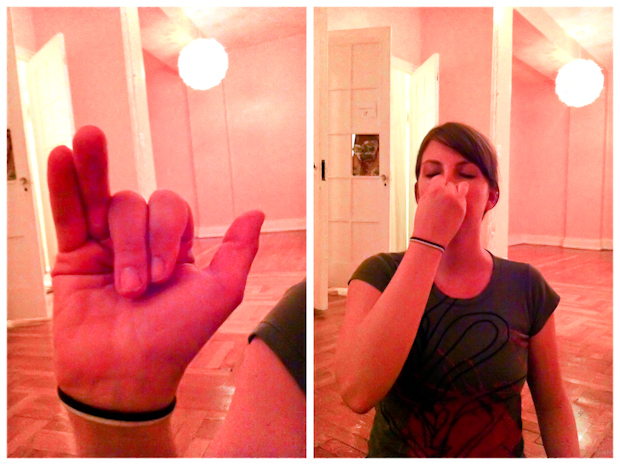 As you inhale, close off the left nostril with your fingers and breath into just the right. To exhale, close off the right nostril and breathe out through the left. Then breathe in through the left and out through the right. Continue like this, alternating side to side for as many rounds as you can do with ease and without forcing. Thank you Alex!! To read more about Alex and find her class schedule, check out her website HERE! In trying to come up with a recipe to include with Alex’s yoga post, I got thirsty just thinking about moving in this heat (something I’ve done many, many times). I also wanted something that doesn’t require a lot of dishes or kitchen space, something you can make to rejuvenate yourself in the middle of a move. This time of year I find myself craving hydrating water flavored with fresh, natural ingredients like fruits, vegetables, and herbs. When I put cucumber in water, I giggle to myself and call it “spa water.” Fresh mint or a medley of citrus are other favorites of mine. Adding fresh herbs, fruit, or even cucumber to water makes it even more refreshing, and the perfect way to hydrate this summer. Fill a large pitcher with ice cold filtered water. Add the sliced cucumber or mint or citrus (or some combination thereof - mint and cucumber is delicious too!). Put it in the fridge and allow to infuse for about 30 minutes. Serve over ice or keep in the fridge for up to 24 hours. Love flavored waters in the heat – so refreshing and a nice change from plain water. I must try these yoga moves too! I’ve only done yoga in a class ages ago. I really enjoyed it and should really get back into it. I used to do Bikram yoga… I think that was before I have my kids. Oh boy more than 6 years ago! >_< Okay probably time to go back and try to be in good shape! It was a fun post! Thank you Alex! 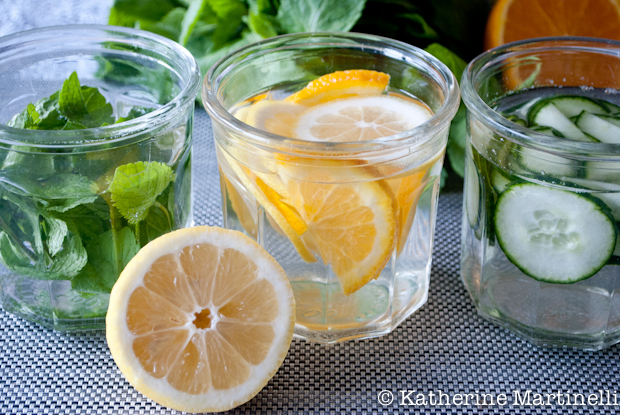 Strawberry & Mint, Pineapple & MInt, Orange & Rosemary, Lemon & Thyme-are also really good flavored water combinations. Thanks for this unique post. How cool you studied abroad in India! Yoga is magic. I have yet to have a physical problem it could not heal. I am incredibly jealous of your friendship with such an incredible person and teacher. I also love cucumber water! Those waters are an amazing idea, thank you for sharing. I enjoyed Alex’s guest post and it’s motivating me to think about yoga again…I, too, feel so much better and more clear-headed after it. Love your selection of waters, as well. Your photo is beautiful! Found the post vey interesting and helpful: am trying to work around this area whenever possible. Did not like the first sound of ‘flavoured water’ [I drink gallons of the pure stuff daily 😀 ! ], but actually feel I would love the simple additions hugely: thanks!! I use to do a lot of yoga but due to physical limitations I can’t do as many as I use to but there are a few, like Paschimottanasana that I do religiously. The breathing one is new to me and something I need to try. Great post! Love the spa water also! It’s amazing how just a little bit of mint or a couple of cucumber slices can turn water into a refreshing soothing drink! Wow, great ingredients. I think i’ll take these and make Flavoured Bottled Water! A perfect drink for a day out.